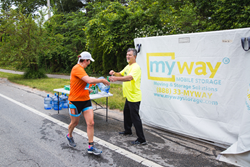 “Using MyWay boxes to organize our supplies and have them delivered on the course for volunteers to use has made our event incredibly efficient”, Ann Vidro Race Co-Director says. “This is just one of the many unique ways to use MyWay boxes. MyWay believes in supporting their local community. Triathlete’s average income is $126,000 per year. Eighty-five percent of triathletes have attended or graduated from a four-year college; and 28% hold a Master’s degree or higher. The race is scheduled for this Sunday, August 19th.